Immunization of mice with self-Ag arrayed on the surface of papillomavirus-like particles induces long-lasting high-titer IgG production by autoreactive B cells. In contrast, immunization with disorganized self-Ag linked to foreign Th epitopes induces weak autoantibody responses that are predominantly of the IgM isotype. In this study, we evaluated the structural correlates of autoantibody induction to determine the basis of these disparate observations, using a system in which mice were vaccinated with a fusion protein containing self (TNF-α) and foreign (streptavidin) components, conjugated to biotinylated virus-like particles (VLPs). Similar titers of autoantibodies to TNF-α were elicited using conjugated polyomavirus VLPs and papillomavirus VLPs, indicating that acute activation of dendritic cells by the Ag is not required. Strong autoantibody responses were also induced by conjugated papillomavirus capsid pentamers, indicating that a higher order particulate structure is also not required. However, a reduction of self-Ag density on VLP surfaces dramatically reduced the efficiency of IgG autoantibody induction. In contrast, the negative effects of reductions in foreign Ag density were limited and could be overcome by dosage and adjuvant. These data suggest that the immune system has evolved to differentially recognize closely spaced repetitive Ags and that the signals generated upon interactions with high-density self-Ags can overwhelm the normal mechanisms for B cell tolerance. Although B cells that are specific for central self-Ags are continuously generated, these self-reactive B cells usually face elimination (1, 2) or receptor editing (3, 4), or undergo functional anergy (5) during their development. Even when potentially autoreactive B cells do encounter self-Ags, IgG autoantibody responses are induced only when B cells receive a second signal from Th cells (6), a signal that is not normally provided for self-Ags. Experimentally it has been shown that self-Ags artificially linked to foreign Th epitopes can elicit autoantibodies, but these immunogens predominantly induce autoreactive IgM rather than IgG unless the Ag is injected at multiple times at high doses in combination with potent conventional adjuvants (7, 8, 9, 10). In contrast, high-titer IgG autoantibody induction occurs upon immunization with self-Ags arrayed on viruses or virus-like particles (VLP)2 (11, 12). It has been proposed that repetitive determinants at a spacing of 50–100 Å are unique to microbial Ags and, therefore, the mammalian immune system has evolved to respond strongly to this arrangement of epitopes (13, 14, 15). Using immunogens in which repetitively arranged self-antigenic epitopes are arrayed on the surface of virus or virus-like particles, strong autoantibody responses have been elicited against either an introduced transgene (16, 17) or self-Ags (11, 12, 18). For example, immunization with a model Ag containing self (TNF-α) and nonself (streptavidin (SA)) fusion domains, conjugated to biotinylated papillomavirus VLPs, induced a 1000-fold increase in autoantibody titers, relative to animals injected with the fusion protein alone (12). Coadministration of a strong adjuvant, such as CFA, could complement, but not substitute for, conjugation to VLPs. In addition, immunization with VLP-conjugated Ag markedly diminished humoral immune distinctions between the self and nonself domains of the fusion protein. Although it has been established that conjugated virus particles are able to circumvent the normal mechanisms of B cell tolerance, it is unclear whether the particulate nature of the Ag, the density of the repeated antigenic epitopes, or specific activation of immune cells by virus particles plays the dominant role in breaking B cell tolerance. 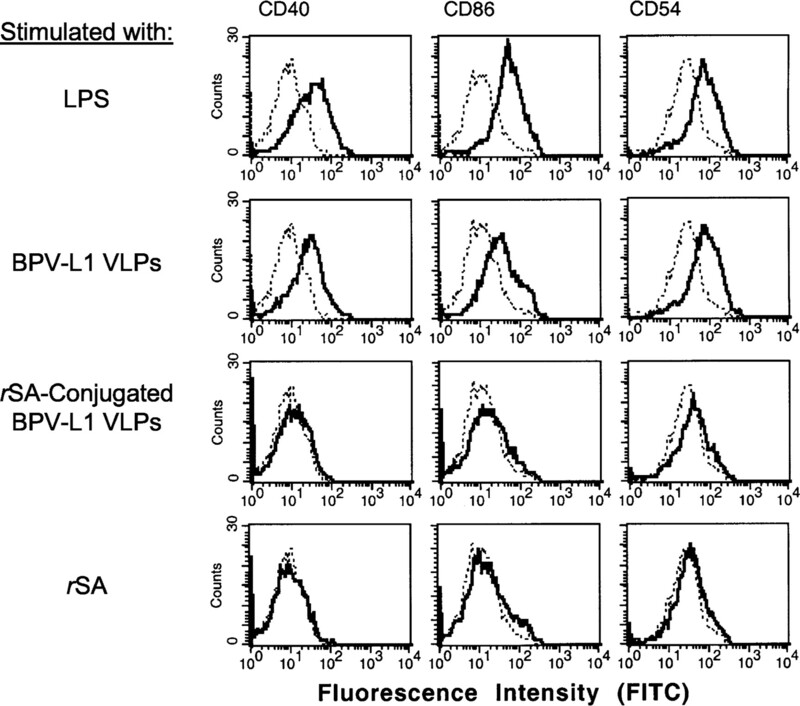 Papillomavirus VLPs are intrinsically immunogenic; systemic vaccination of VLPs without adjuvant induces high titers of neutralizing Abs and strong CTL responses (19, 20, 21, 22, 23). This immunogenicity may be related to the ability of papillomavirus VLPs to avidly bind and potently activate dendritic cells (DCs) in vitro (24, 25). Thus, it is possible that activated DCs play a role in subsequent activation of autoreactive B cells, because interactions with DCs have been implicated in B cell differentiation and isotype switching (26). Therefore, we set out to systematically explore the structural correlates of autoantibody induction. By taking advantage of the ability to conjugate the SA-TNF-α Ag onto diverse virion-derived structures at different levels of occupancy, we examined the relative contributions of particle type, size, and Ag density in the induction of Abs against self and foreign Ags. VLPs were generated from recombinant baculovirus-infected Sf9 cell cultures, as described previously (27). We generated papillomavirus VLPs composed of the L1 major capsid protein from the strains human papillomavirus (HPV)16(K), the assembly-deficient mutant HPV16(P), and bovine papillomavirus (BPV). Human polyomavirus VLPs were composed of the BK virus (BKV) VP1 major capsid protein (24, 28). 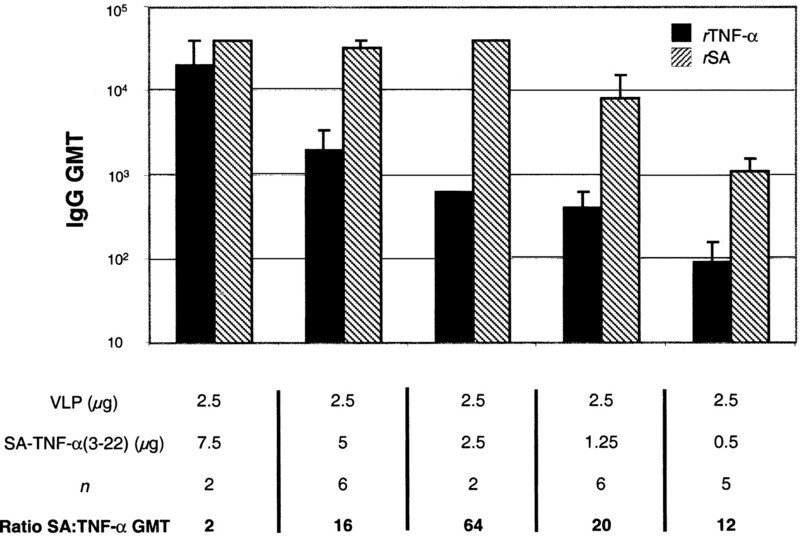 VLPs were biotinylated by incubation with NHS-LC-Biotin (Pierce Endogen, Rockford, IL) at a 1:2 (weight:weight) ratio for 60 min at room temperature. Biotinylated VLPs were purified by layering the mixture onto a 24–54% linear sucrose gradient, followed by ultracentrifugation (200,000 × g, 3 h) using an SW-40 rotor (Beckman Instruments, Palo Alto, CA). Fractions were harvested from the bottom and analyzed by SDS-PAGE and Coomassie blue staining for the presence of L1 or VP1. VLP-containing fractions were pooled and quantitated. The SA-TNF-α fusion construct SA-TNF-α3–22 was engineered, expressed in bacteria, and purified from inclusion bodies, as described previously (12). SA-TNF-α3–22 was purified to homogeneity by applying soluble protein to a 2-iminobiotin-agarose column (Pierce Endogen) and following the manufacturer’s instructions. The active concentration of SA-TNF-α fusion protein was determined by ELISA by measuring reactivity to biotinylated BSA (Pierce Endogen) immobilized (at 200 ng/well) on Immulon II microtiter plates (Dynex Technologies, Chantilly, VA), as described previously (12). Conjugated VLPs were prepared by incubating biotinylated VLPs with saturating amounts (unless stated otherwise) of SA-TNF-α3–22, rSA (Zymed Laboratories, South San Francisco, CA), or a mixture of SA-TNF-α3–22 and rSA for 1 h at room temperature with gentle rocking. Conjugated particles were separated from unconjugated SA-TNF-α fusion protein using a MidJet cross flow filtration system and MidGee cartridges with a 500-kDa pore size (A/G Technologies, Needham, MA). The relative ability of SA-TNF-α3–22 and rSA to bind biotinylated BPV-L1 VLPs was measured by ELISA. Biotinylated BPV-L1 VLPs were immobilized (at 150 ng/well) on Immulon II microtiter plates (Dynex Technologies). After blocking with PBS-0.5% nonfat dry milk (50 μl) for 1 h at room temperature, 100 ng of a mixture of rSA and SA-TNF-α3–22 were reacted in 50 μl for 1.5 h at room temperature with the immobilized biotinylated VLPs with gentle rocking. After five washes with PBS, specific binding to biotinylated VLPs by SA-TNF-α3–22 was detected using a rabbit anti-mouse TNF-α polyclonal Ab (50 μl; Pierce Endogen) at a 1/1000 dilution in PBS-0.5% milk for 1 h at room temperature. After three washes with PBS, HRP-labeled goat-anti-rabbit IgG (50 μl; Boehringer Mannheim, Indianapolis, IN) was added at a 1/3000 dilution in PBS-0.5% milk for 1 h at room temperature. After three washes with PBS, the substrate ABTS (Boehringer Mannheim) was added, and OD405 was read. Data is based on the average OD of triplicate wells. SA-TNF-α3–22 binding to biotinylated VLPs in the presence of rSA was also demonstrated by sucrose gradient centrifugation (using the conditions described above). Fractions were applied to nitrocellulose membranes by slot blot and assayed for L1 or TNF-α by Western blot using the TNF-α polyclonal Ab mentioned previously, or an anti-L1 mAb (MAB837; 1/5000 dilution; Chemicon International, Temecula, CA). Antiserum was prepared by inoculating 6- to 8-wk-old C57BL/6 mice with conjugated particle preparations. Mice were inoculated i.m. three times at 2-wk intervals. When CFA was used, Ag was diluted 1/1 in CFA for the initial injection, and diluted 1/1 in IFA for subsequent inoculations. Sera were collected at each injection and 2 wk after the final boost. Animal care was in accordance with National Institutes of Health guidelines. Mouse Abs to biologically active recombinant mouse TNF-α (PeproTech, Rocky Hill, NJ) or rSA (Zymed Laboratories) were detected by ELISA using 200 ng of the target protein per well, as described (12). Briefly, mouse serum was serially diluted in PBS-0.5% milk and applied to wells. Reactivity to target Ag was determined using a 1/2000 dilution of HRP-labeled goat anti-mouse IgG (BD PharMingen, San Diego, CA). Upon development, OD405 was read, using a ThermoMax microplate reader. OD405 values that were greater than twice background (usually >0.1) were considered positive. BMDCs were generated from bone marrow cells of C57BL/6 mice by negative selection of lineage marker-positive cells using magnetic beads (anti-CD4 (L3T4), anti-CD8a (Ly-2), anti-CD19, and anti-NK cell (DX5) MicroBeads; Miltenyi Biotec, Auburn, CA) and culture in murine rGM-CSF (1000 U/ml) and murine rIL-4 (1000 U/ml; both BD PharMingen) (29). After 6 days at 37°C, cells were harvested and preparations contained 67–88% DCs, as assessed by CD11c expression. The day-6 BMDCs were replated at 1 × 106 cells/ml in 24-well plates and exposed to BPV-L1 VLPs (10 μg/ml), rSA-conjugated BPV-L1 VLPs (10 μg/ml), or rSA (10 μg/ml) for 24 h. LPS (Escherichia coli 026:b6; Sigma-Aldrich, St. Louis, MO) (1 μg/ml) served as positive control for DC maturation. Cells were collected into cold HBSS without Phenol Red (Life Technologies, Grand Island, NY) plus 0.1% BSA (Life Technologies) and 0.1% sodium azide (Sigma-Aldrich). To avoid nonspecific binding of labeled Ab, FcBlock (purified rat anti-mouse CD16/CD32; BD PharMingen) was added at 1 μg for 106 cells. Double staining was performed using mAbs against the following mouse surface Ags (all BD PharMingen): FITC-CD40 (3/23, rat IgG2a), FITC-CD54 (3E2, hamster IgG), FITC-CD86 (GL1, rat IgG2a), PE-CD11c (HL3, hamster IgG), and appropriate control Abs. A total of 105 cells per assay were incubated with the respective Abs at a concentration of 2.5 μg/sample for 30–45 min at 4°C. After two rounds of washings, cellular fluorescence was monitored by flow cytometry using a FACSCalibur instrument and analyzed using CellQuest software (both BD Biosciences, Mountain View, CA). To examine whether the ability to induce autoantibodies is a common characteristic of naked icosahedral VLPs with repetitive structure or whether papillomavirus VLPs have a unique capacity, mice were immunized with self-Ag conjugated to human polyomavirus BK (BKV) VLPs or BPV VLPs. Polyomavirus VLPs are morphologically similar, but genetically unrelated, to papillomavirus VLPs. Both VLPs are composed of 72 pentamers of a major capsid protein (L1 for papillomaviruses and VP1 for polyomaviruses) arranged in T = 7 symmetry, although polyomavirus VLPs are slightly smaller in diameter (45–50 nm vs 55–60 nm for papillomavirus VLPs) (30, 31, 32). However, unlike papillomavirus VLPs, polyomavirus VLPs do not induce the maturation of mouse BMDCs (24). Using the system that we developed previously to make conjugated particles, BPV-L1 VLPs and BKV-VP1 VLPs were biotinylated and conjugated with saturating amounts of a SA-(mouse TNF-α) fusion protein that had been demonstrated to induce high-titer autoantibodies to mouse TNF-α when conjugated to BPV-L1 VLPs. Groups of three C57BL/6 mice were immunized with three doses of 5 μg of conjugated VLPs, with and without coadministration of CFA. Two weeks after the final boost, sera were taken from immunized mice, and IgG Abs specific for the foreign (SA) and self (TNF-α) Ag components of the vaccine were measured by ELISA using native full-length rSA and rTNF-α proteins as the target Ags. 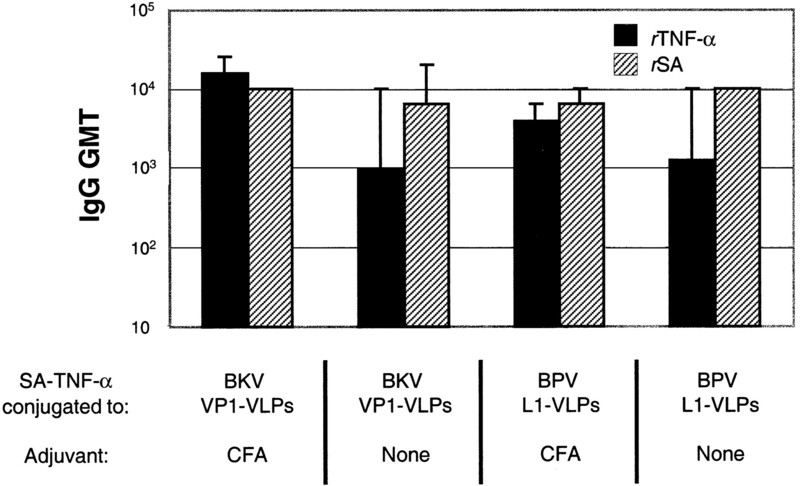 Conjugated BKV-VP1 VLPs elicited similar Ab responses as conjugated BPV-L1 VLPs (Fig. 1⇓). Both conjugated VLPs, when given without exogenous adjuvant, induced high-titer autoantibodies (approximate geometric mean titer (GMT) of 103) against TNF-α, and coadministration of CFA further boosted titers ∼10-fold. Ab responses to the foreign (SA) and self (TNF-α) components of the conjugated particle vaccine were similar regardless of the VLPs used. Both conjugated VLPs induced autoantibody responses that were ∼1000-fold higher than when mice were immunized with unconjugated SA-TNF-α3–22 alone (data not shown and Ref. 12). Thus, structurally similar polyomavirus and papillomavirus VLPs can function as autoantibody-inducing conjugated vaccines. Conjugated BPV-L1 VLPs and BK-VP1 VLPs elicit Ab responses of similar magnitude. BPV-L1 VLP or BK-VP1 VLPs were biotinylated and conjugated with SA-TNF-α3–22 at a 1:2 (weight:weight) ratio. Mice were immunized with 5 μg of VLPs three times at 2-wk intervals. Sera were isolated 2 wk after the final vaccination, and IgG Ab titers to rTNF-α (▪) and rSA (▨) were determined by ELISA. Mice were immunized with or without coadministration of CFA, as indicated. Data represent the GMTs from groups of three mice. Error bars represent SEM. These results suggest that DC activation by papillomavirus VLPs may not play a role in autoantibody induction. DC activation by VLPs is most likely initiated by surface interactions between virus particles and VLP-specific receptors (24). Because conjugated particles are coated with nonpapillomavirus proteins, the modified VLPs may lose their ability to bind and thereby activate DCs. To test this hypothesis, we examined whether rSA-conjugated BPV-L1 VLPs can activate mouse BMDCs. Unlike LPS or unconjugated BPV-L1 VLPs, rSA-conjugated VLPs failed to up-regulate surface expression of three maturation markers (CD40, CD86, and CD54) on BMDCs (Fig. 2⇓). These data indicate that conjugation of rSA to the surface of BPV-L1 VLPs abrogates the specific interactions with immature DCs that lead to DC activation, and confirm that DCs are unlikely to be a critical differential mediator of autoantibody induction by VLPs. rSA conjugation of BPV-L1 VLPs inhibits the ability of VLP to induced phenotypic activation of murine BMDCs. Day-6 BMDCs were exposed to LPS (1 μg/ml), BPV-L1 VLPs (10 μg/ml), rSA-conjugated BPV-L1 VLPs (10 μg/ml), or rSA (10 μg/ml), and 24 h later, cell surface expression of costimulatory molecules CD40 and CD86 and adhesion molecule CD54 was determined by flow cytometry (solid line). Background expression of the markers on untreated cells is shown as a dotted line. Histograms depict expression patterns on BMDCs gated for CD11c. This experiment was performed twice with similar results. To determine whether the particulate nature of L1 VLPs is critical for autoantibody induction, we compared the relative efficiency of autoantibody induction by VLPs to that of the major subunit of VLPs, the L1 pentamer. To perform this comparison, we used two HPV16 L1 capsid genes that vary in their ability to form virus-like structures. Whereas HPV16(K)-L1 self-assembles into full-sized 72-pentamer VLPs, the assembly-deficient mutant HPV16(P)-L1 has a single amino acid change in L1 and predominantly forms unassembled pentamers or irregular aggregates (33). Unlike full-size VLPs, HPV16(P)-L1 pentamers fail to induce neutralizing Abs upon vaccination (34). HPV16(K)-L1 VLPs or HPV16(P)-L1 pentamers were generated using a baculovirus expression system and purified and biotinylated using the same standard methods. Subsequently, HPV16(P)-L1 pentamers were separated from larger irregular aggregates of pentamers by an additional sucrose gradient centrifugation purification. Although the extent of biotinylation on L1 pentamers was not directly measured, we have estimated that conjugated L1 VLPs have ∼1.5 SA tetramers bound per L1 molecule, which translates to ∼540 SA tetramers (and 2160 copies of the TNF-α peptide) per VLP (12). By extension, we predict L1 pentamers to have a minimum of 7.5 SA tetramers (30 TNF-α peptides) per pentamer. This may be an underestimate, since additional biotin molecules may attach to primary amines that are accessible on pentamers but not on VLPs because they are on residues that are normally internal. Even though pentamers are significantly smaller than VLPs, conjugated pentamers would be predicted to preserve the same spacing of self-Ag as conjugated VLPs. 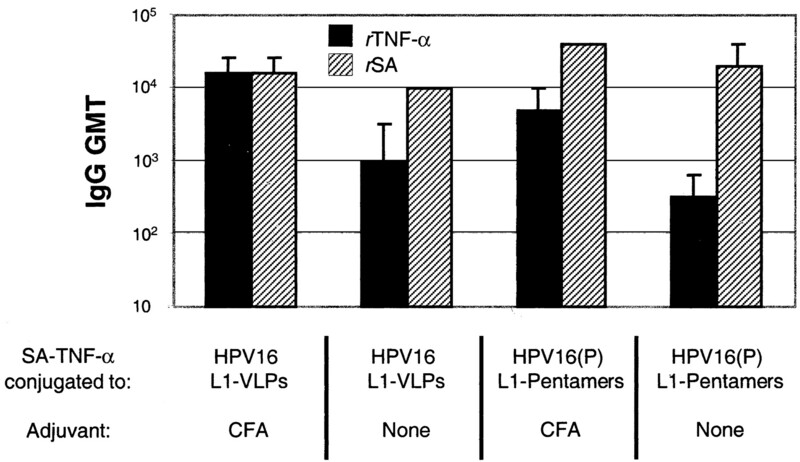 Groups of C57BL/6 mice were immunized with three doses of 5 μg of HPV16(P)-L1 pentamers or HPV16(K)-L1 VLPs, conjugated to 10 μg of SA-TNF-α3–22, with and without coadministration of CFA. Preparations were analyzed by Superose 6 gel filtration chromatography to ensure that the pentamers had not aggregated in vitro upon conjugation with SA-TNF-α3–22 (11). SA-conjugated HPV16(P)-L1 pentamers eluted quantitatively in the pentameric fraction (data not shown). Conjugated pentamers elicited strong autoantibody responses against TNF-α, although they were marginally less effective (∼3-fold less) at generating autoantibody responses than conjugated VLPs (Fig. 3⇓). Responses against the foreign component of the preparation (SA) were slightly higher (2-fold) than when conjugated VLPs were used, suggesting that conjugated pentamers may be somewhat less potent than conjugated VLPs at diminishing immune distinctions between self and foreign Ags. These data indicate that the lack of neutralization epitopes on HPV16(P)-L1 pentamers does not interfere with the ability of conjugated pentamers to induce autoantibodies. Significantly, the data also suggest that the particulate nature of the VLP is not critical for inducing autoantibody responses. However, we cannot definitively rule out the possibility that pentamers may form aggregates in vivo upon immunization that may functionally mimic the particulate nature of wild-type VLPs. Comparison of IgG Ab titers induced by conjugated VLPs or pentamers. HPV16-L1 VLPs or HPV16(P)-L1 pentamers were biotinylated and conjugated with SA-TNF-α3–22 at a 1:2 (weight:weight) ratio. Mice were immunized with 5 μg of L1 three times at 2-wk intervals. Mice were immunized with or without coadministration of CFA, as indicated. Data represent the GMTs from groups of three mice (VLPs) or two mice (pentamers). Error bars represent SEM. To examine whether autoantigen spacing influences autoantibody induction, mice were immunized with VLPs coated with self-Ag at different densities. To ensure that any differences in immune responses were not the result of dose effects, the amount of SA-TNF-α3–22 per vaccination was kept constant, but the protein was dispersed over varying numbers of VLPs. For example, animals immunized with particles that were completed coated with SA-TNF-α3–22 were injected with 1 μg of biotinylated VLPs conjugated to 2 μg of SA-TNF-α3–22. Density of self-Ag was reduced to 10%, for example, by conjugating 10 μg of biotinylated VLPs with 2 μg of SA-TNF-α3–22 mixed with 18 μg of rSA. In addition, mice were inoculated with VLPs with self-Ag densities representing 50 and 20% of maximal occupancy. To ensure that SA-TNF-α3–22 bound biotinylated VLPs competitively in the presence of rSA, we examined conjugated particles by ELISA (Fig. 4⇓) and analytical sucrose gradient (data not shown). The expected amounts of SA-TNF-α3–22 bound to VLPs at all of the densities tested. SA-TNF-α fusion protein binds biotinylated VLPs in the presence of rSA. Detection of SA-TNF-α3–22 bound to biotinylated BPV-L1 VLPs in the presence of rSA by ELISA. Wells were coated with biotinylated VLPs and then incubated with a mixture of SA-TNF-α3–22 and rSA at various ratios. Binding of SA-TNF-α3–22 to biotinylated VLPs was detected using a polyclonal Ab against mouse TNF-α. Results reflect the average OD of triplicate wells, normalized against the OD value generated when only SA-TNF-α3–22 was used. Error bars represent SEM. Mice were immunized three times, and 2 wk after the final boost, sera were taken and IgG Ab responses were analyzed by ELISA (Fig. 5⇓). Each reduction of self-Ag density had a corresponding effect of diminishing autoantibody titers. When self-Ag density was decreased 2-fold (i.e., to 50% maximal occupancy), autoantibody titers were reduced 5- to 8-fold, depending on whether adjuvant was used. When mice were immunized with the same dose of SA-TNF-α3–22, but self-Ag was conjugated onto particles at one-fifth of maximum density, autoantibody titers were reduced 15- to 40-fold, and when density was reduced to one-tenth of maximum occupancy, autoantibody titers were reduced 300-fold. 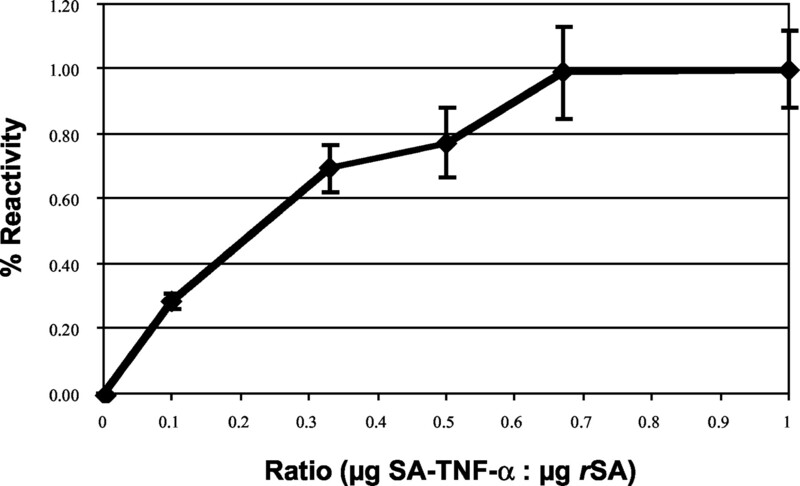 At this density, autoantibody titers were just above background levels and similar to levels elicited upon immunization with SA-TNF-α3–22 alone (shown here and in Ref. 12). 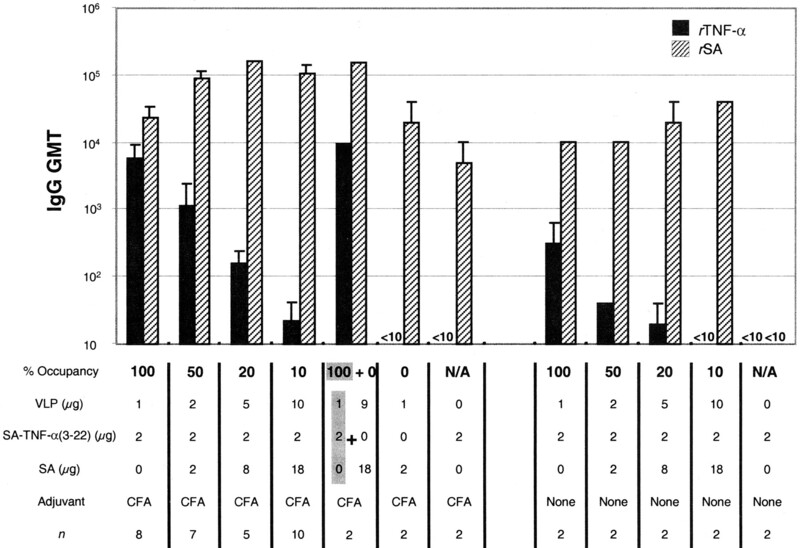 In the absence of CFA, immune responses were lower, but decreases in self-Ag density had similar relative effects on autoantibody levels as with CFA. Comparison of IgG Ab titers induced by particles conjugated at variable densities. BPV-L1 VLPs were biotinylated and conjugated with mixtures of SA-TNF-α3–22 and rSA as shown. A constant amount of SA-TNF-α3–22 (2 μg) was injected per inoculation. Variable amounts of biotinylated VLPs and/or rSA were injected per group, as indicated. Sera were isolated 2 wk after the final vaccination and IgG Ab titers to rTNF-α (▪) and rSA (▨) were determined by ELISA. Data represent the GMTs from groups of C57BL/6 mice; the number of animals in each group (n) is specified. Adjuvant was used as indicated. A value of <10 indicates that the GMT was below background levels. Error bars represent SEM. To assess the effects of boosting on autoantibody titers, sera were collected from a subset of animals after two immunizations (i.e., 2 wk after the second injection) and Ab responses were compared with the final titers. In mice immunized with fully conjugated VLPs (i.e., 100% occupancy), autoantibody responses were boosted ∼15-fold with the third immunization. At lower occupancies, the effect of boosting was less pronounced, increasing autoantibody titers ∼5- to 10-fold at 50 and 25% occupancy, respectively, and ∼4-fold at 10% occupancy. Therefore, boosting increased autoantibody titers to a greater extent in mice immunized with high-occupancy conjugated VLPs than in those with low-occupancy conjugated VLPs, thereby increasing the differences in autoantibody titers between these groups. To address the possibility that competition between SA-specific B cells and self-Ag-specific B cells might account for the decreased autoantibody response in mice immunized with particles conjugated at lower densities, mice were also immunized with a mixture of 1 μg of L1 VLPs fully conjugated with SA-TNF-α3–22 and 9 μg of L1 VLPs fully conjugated to rSA. Immunization with this mixture elicited high anti-TNF-α Ab responses, at levels that were similar to those in animals immunized with maximally conjugated SA-TNF-α VLPs alone, and 200-fold higher than when mice were immunized with 10 μg of VLPs at 10% occupancy (Fig. 5⇑). Thus, in this situation, immunodominance by the foreign antigenic components of the vaccine (i.e., L1 or SA) plays a negligible role in diminishing immune responses against TNF-α, indicating that self-Ag density is the primary determinant in induction of anti-TNF-α IgG. The data described above, when taken together with previous results demonstrating that vaccination with unconjugated SA-TNF-α3–22 can elicit IgG Ab responses against SA, suggest further that Ag density may be less important for inducing Ab responses against foreign Ags than self-Ags at these doses. To examine how surface density may differentially affect immune responses to foreign Ags vs self-Ags, we immunized groups of mice with a constant dose of VLPs (2.5 μg) conjugated with decreasing amounts of SA-TNF-α3–22 in CFA (Fig. 6⇓). When VLPs were coated with saturating amounts of SA-TNF-α3–22, immune responses against the self and foreign components of the protein were similar (the ratio of SA to TNF-α GMTs was 2). As the amount of SA-TNF-α3–22 on the surface of particles decreased, Ab responses against both self and foreign declined, but at different rates and to different degrees. Ab responses against TNF-α declined steadily as the density of Ag decreased. This decrease did not result from a decrease in the dose of SA-TNF-α3–22 per inoculation, as we observed little decline in anti-TNF-α Ab titers in mice immunized with lower doses of fully conjugated VLPs. For example, autoantibody titers declined 2-fold in mice immunized with 0.5 μg vs 2.5 μg of fully conjugated VLPs (data not shown). In contrast, Ab responses against SA were relatively stable at the three highest densities tested (and the ratio of SA to TNF-α IgG GMTs increases from 2 to 16 to 64). A decline in Ab responses against SA was observed only when mice were immunized with VLPs coated with the lowest amounts of fusion protein. Conjugation of SA-TNF-α3–22 to VLPs can increase Ab responses to SA (there is a 5-fold boost in Ab titers after conjugation at high density, as seen in Fig. 5⇑), so this decline in Ab responses to SA at low dose/low occupancy may, in part, reflect a loss of this enhancing effect. Therefore, although high Ag density is critical for generating high-titer IgG Ab responses against self, it provides only a moderate quantitative boost in IgG Ab responses against foreign. Comparison of IgG Ab titers induced by particles conjugated with decreasing amounts of SA-TNF-α3–22. SA-TNF-α3–22 was conjugated to 2.5 μg of biotinylated BPV-L1 VLPs at ratios (weight:weight) ranging from 3:1 to 0.2:1. C57BL/6 mice were immunized three times at biweekly intervals with CFA, and sera were collected 2 wk after the final vaccination. IgG Ab titers to rTNF-α (▪) and rSA (▨) were determined by ELISA. Data represent the GMTs from groups of C57BL/6 mice; the number of animals in each group (n) is specified. A value of <10 indicates that the GMT was below background levels. Error bars represent SEM. Our laboratory and others have demonstrated that high-titer IgG Ab responses against self-Ags can be induced by virus surfaces or bacteria coated with self-Ag, but not when the same Ag was presented in a disordered form (11, 12, 18). Here, we extend these observations by systematically exploring the structural correlates of autoantibody induction by VLPs. These studies were facilitated by a flexible conjugation strategy allowing us to attach a central self-Ag to several virus-derived structures at variable densities. These analyses suggest for the first time that the density of self-Ag on an immunogen, rather than a higher order particulate structure, is the critical factor in the induction of autoantibody responses against a model self-Ag. We demonstrated that self-peptides conjugated to papillomavirus and polyomavirus VLPs induced similar IgG autoantibody responses. The fact that polyomavirus VLPs do not induce acute activation of BMDCs (24), coupled with our data demonstrating that SA conjugation abrogates the ability of papillomavirus VLPs to activate BMDCs, indicates that direct activation of DCs by the immunogen does not play a critical role in autoreactive B cell responses. Presumably, any highly ordered Ag with repetitive, dense spacing (including other viruses, bacterial pili, or synthetic particles) could function as conjugated immunogens to induce autoantibody responses. Consistent with this idea, Fehr et al. (18) reported that Ab bound at high density to vesicular stomatitis virus particles or UV-inactivated bacteria (Salmonella typhi and Pseudomonas aeruginosa) induced anti-Ig autoantibody responses. To further define the requirements for autoimmune activation, we performed experiments examining the effects of Ag size and density on autoantibody induction. Somewhat surprisingly, conjugated HPV16(P)-L1 pentamers induced autoantibodies at only a slightly reduced efficiency relative to full-size 72-pentamer VLPs. Although pentamers are predicted to have the same spacing of self-Ag, they may contain as few as 30 TNF-α peptides. This analysis indicates that a large particulate Ag is not required for effective autoantibody induction, although it does not establish a lower limit for the number of repeated epitopes needed to accomplish this. High Ag density was critical for autoantibody induction. In experiments in which we controlled for dose and the possibility of immune dominance by competing foreign antigenic epitopes, we observed that reducing the density of self-Ag on VLP surfaces dramatically diminished autoantibody responses. Based on our previous estimate of 1.5 SA-TNF-α tetramers per L1 molecule, we calculate that the tetramers on particles which are fully conjugated are spaced ∼60 Å apart (data not shown). This distance increases to 85 Å at 50% density, 140 Å at 20% density, and 195 Å at 10% density. Our finding that autoantibody responses are strongest to conjugated VLPs with 100 and 50% occupancy, but decrease rapidly in response to immunization with lower occupancy particles, supports the previous proposal that the immune system has evolved to respond strongly to Ags with an epitope spacing of 50–100 Å (13, 14, 15). This spacing is often found on microbial surfaces, but seldom in their vertebrate hosts. B cells may have evolved to recognize repetitive Ags with this particular spacing as foreign or dangerous. Our results indicate that B cell recognition of “foreign” structural elements is immunodominant over mechanisms that normally maintain tolerance to soluble central self-Ags. It would be interesting to determine whether further increases in Ag density (that are technically unfeasible using our conjugation system) would result in a further increase, or conversely a decrease, in autoantibody responses. In contrast to autoantibody induction, strong Ab responses against SA can be induced by immunization with SA-TNF-α3–22 conjugated to VLPs at lower densities, as well as with unconjugated SA-TNF-α3–22 tetramers. These data suggest that the signaling required to produce B cell responses specific for foreign Ags at these doses is distinct from, or less stringent than, that required to overcome B cell tolerance. Numerous studies have previously shown that the repetitiveness of foreign Ags, ranging from bacterial flagellin (35), viruses and viral capsids (36, 37, 38), to haptenated polymers (39), can strongly influence B cell responses to foreign epitopes. Binding of repetitively arranged Ags to B cell receptors obviates the need for second signals to induce B cell responses. Thus, induction of IgM, but not class switching to IgG, is independent of T cell help for this class of Ags. T-independent B cell activation has also been correlated with Ag density. For instance, high-density haptenated beads acted as T-independent Ags and low-density haptenated beads acted as T-dependent Ags (35). Thus, it appears that T-independent and autoantibody responses are promoted by similar antigenic structures. However, this correlation is apparently not due to a limitation of T help in our experimental system for breaking B cell tolerance. The SA polypeptide clearly contains Th epitopes that would provide linked T help for the TNF-α autoantigen. This is exemplified by the strong IgG response to the SA portion of the fusion protein, even without conjugation to the VLPs. The similar structural requirements for the induction of autoreactive and T-independent B cell responses may be due to a similar stringent requirements for Ag-induced cross-linking of B cell receptors. Whether the critical downstream signals are the same or distinct for these two types of responses remains to be determined. Interactions between potentially autoreactive B cells and repetitive self-Ags could potentially break tolerance at several stages during the development of the B cell responses, from the initial activation of autoreactive B cells to their proliferation in lymphoid tissues, or for autoreactive B cell survival or escape from anergy after encountering self-Ag in its normal context. Because previous data from our laboratory indicated that both irregularly and repetitively displayed self-Ags elicit similar levels of self-reactive IgM early after immunization (12), we do not favor the idea that the initial B cell activation is the critical point at which Ag structure influences autoantibody responses. Because only densely arrayed self-Ag induced efficient IgG production, we instead favor the hypothesis that self-reactive mature B cells preferentially escape anergy that normally results upon encountering self-Ag in its normal context (5) if they have previously been activated by densely ordered self-Ag. It is also possible that self-Ag-induced anergic B cells could be reactivated upon subsequent interactions with repetitive self-Ag (40). Mechanistic studies of how repetitive Ags promote autoantibody responses could provide insights into how autoreactive B cells arise in autoimmune diseases. In addition, these studies could further the development of autoantibody-inducing vaccines against the mediators of several important diseases, including arthritis, allergies, cancer, and Alzheimer disease. We thank Pete Jensen, Stephan Frye, and Eugene Major for providing the BK-VP1 expression vector, Drajinja Djurickzic and staff at National Cancer Institute-Frederick for assistance with animals, and members of the laboratory for their many helpful suggestions. ↵2 Abbreviations used in this paper: VLP, virus-like particle; SA, streptavidin; DC, dendritic cell; BPV, bovine papillomavirus; HPV, human papillomavirus; BKV, BK virus; BMDC, bone marrow-derived DC; GMT, geometric mean titer.